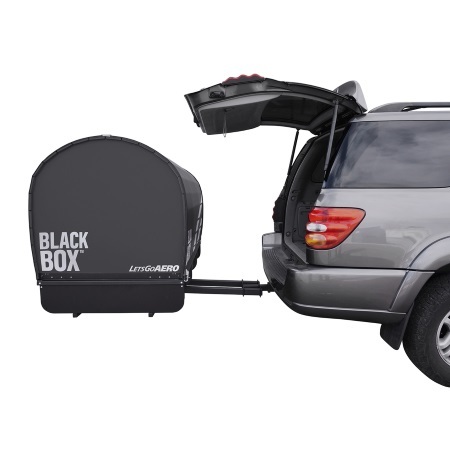 Very few bike racks have been approved to be used on the back of an RV trailer. 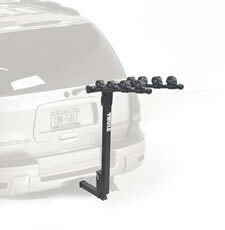 The following are all RV APPROVED RACKS. 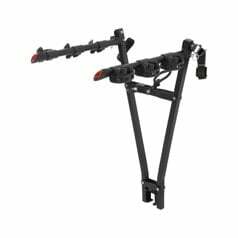 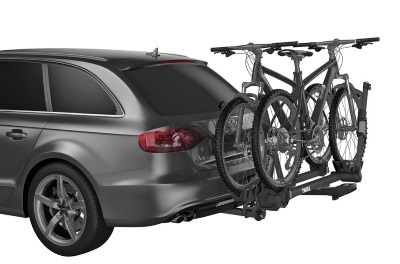 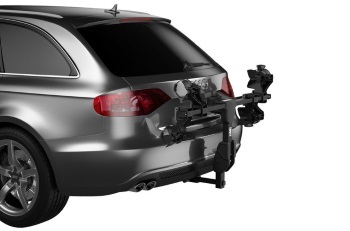 Ultra-light aluminum hitch rack is nearly half the weight of a traditional carrier making for easier installation and removal of rack. 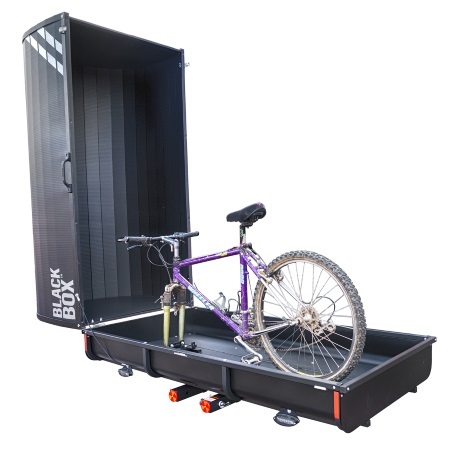 Quick Bike Loading in Seconds. 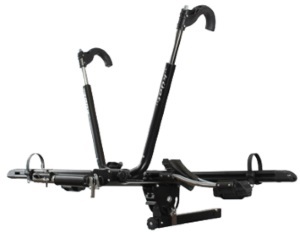 Total carrying capacity of up to 120 lbs. 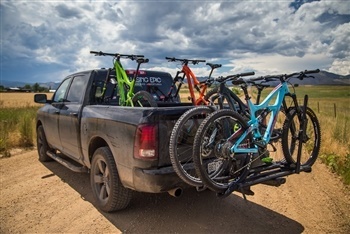 Fits Bikes With Wheel Base Up To 48"
Holds wheelbases up to 47" and tires as large as 3"
Increased spacing between bikes to 14"
Creating the world's most aerodynamic and colorful bike racks since 1993, we've leveraged our knowledge of the bike rack industry and it's ever changing technologies to create the world's most versatile and elegant platform hitch rack. 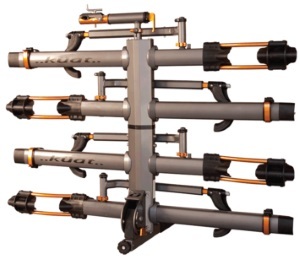 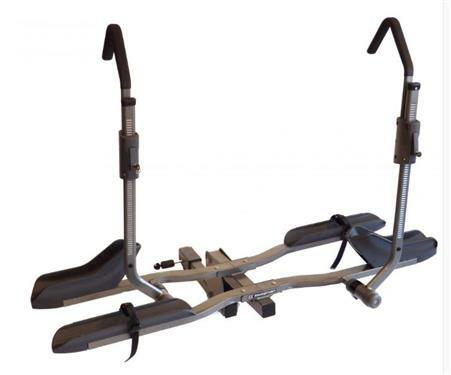 Perfect for the bike enthusiast or recreational rider, the 1.25" SplitRail can accommodate 2 bikes, while the 2" model can handle 2, 3, or 4 bikes. 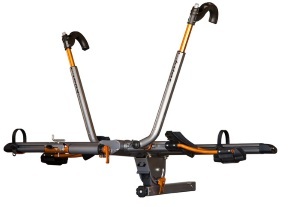 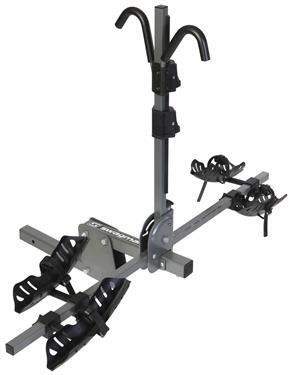 Each strut is engineered with 4" of side-to-side adjustment, which makes fitting anything from kids to adult bikes simple and easy, and no tools are required to install/remove the rack from vehicle. 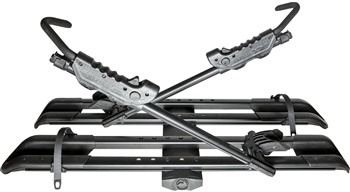 The SplitRail includes our proprietary anti-wobble device for secure attachment to vehicle. 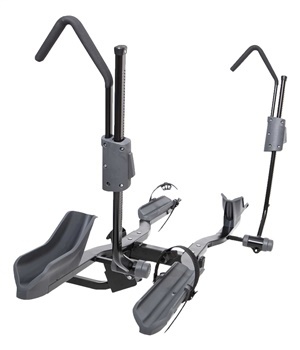 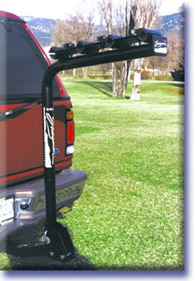 Easily accessible release handle allows the rack to be positioned into stow, use, and tilt positions. 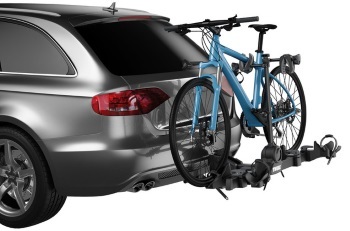 An integrated cable locks secure bikes to rack, and a locking hitch pin secures the rack to the vehicle (lock cores and keys included). 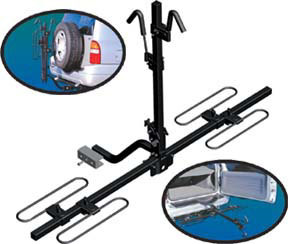 The SplitRail comes with a Wall Mount Storage Hook for staching the rack in the garage when not in use. 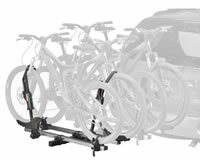 60 lb max weight per bicycle (120 lb total) on 2-bike rack, 40 lb max weight per bike with Add On(s). 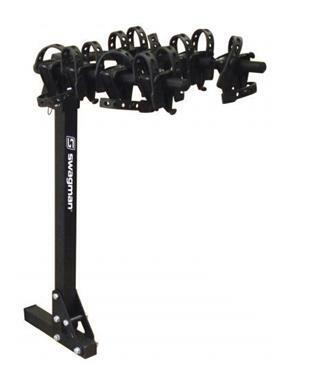 RockyMounts stands by its products by offering a Lifetime Warranty. 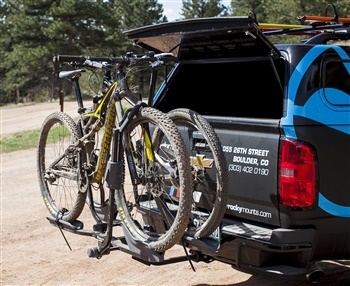 The SouthPark two bike platform rack is a convenient and fuel efficient solution for getting your bike to your next adventure. 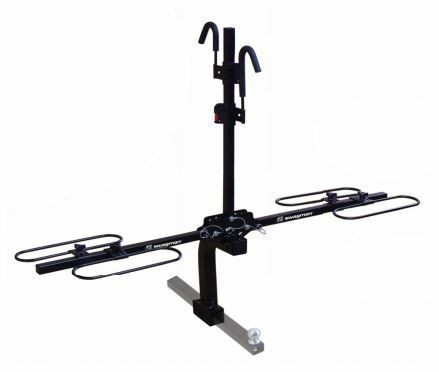 The three position rack is perfect for carrying bikes from a 20" diameter wheel to 29". 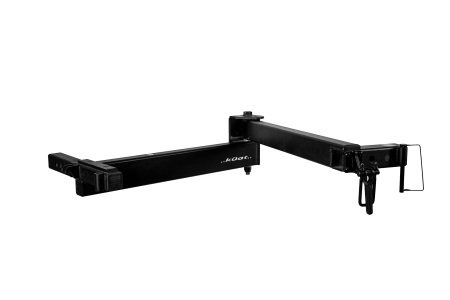 No contact with the frame. 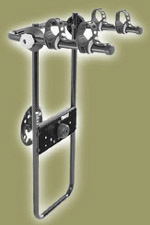 Fits both 1.25" and 2" receivers and includes and anti-wobble bolt. 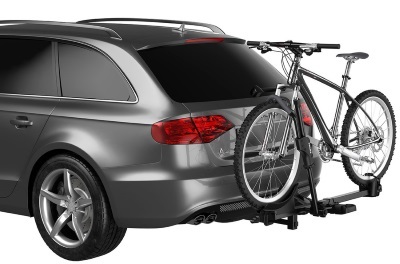 Carries bikes with a wheel size of 20" diameter up to 29"
Fits skinny tire road bikes up to 3.0 mountain tires. 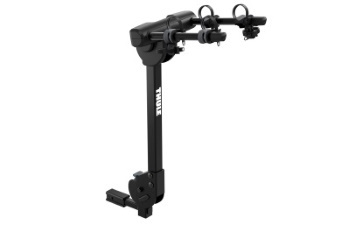 Max wheelbase is 48". 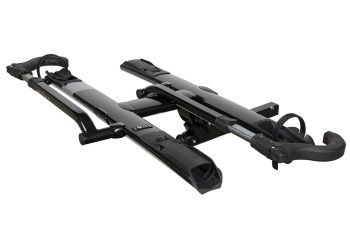 Holds 2 Bikes With Total Capacity of 100 lbs. 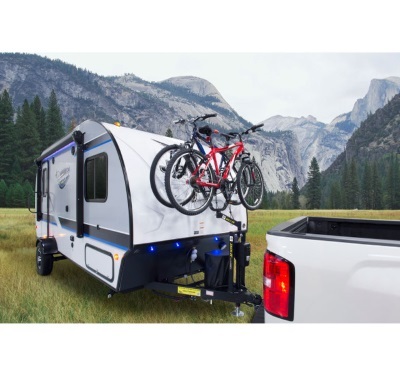 Maximum Towing Capacity of 2,500 lb. 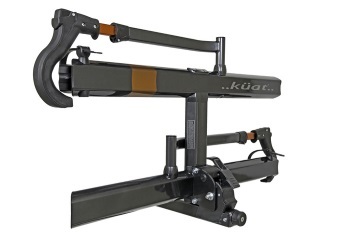 Mounts To Front Of Trailer On "A" Frame Coupler Using The Same Mount Points as The Trailer Tongue Jack (You Still Have Complete Use of the Jack). 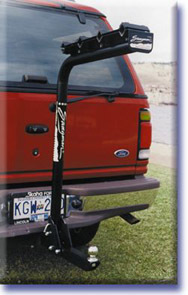 A raised receiver on the "A" frame is the perfect place to put your bikes. 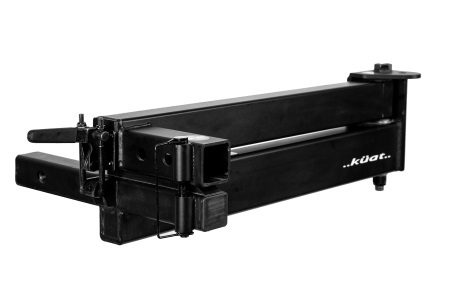 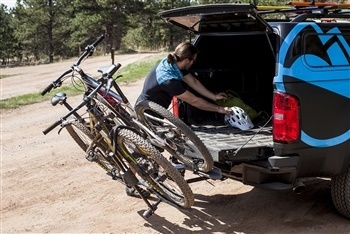 Our Bike Bunk allows any bike rack designed for a 2" receiver to fit. 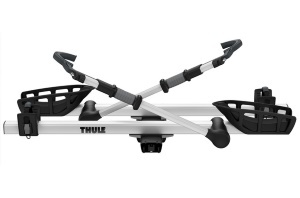 For Full Size Trucks - 61"
For Mid Size Trucks - 54"
Equipped With Thule's Fully Adjustable Cradles For Maximum Bike Stability.